Chromebooks are quite unique as far as working in the cloud is concerned. You can work in the cloud from your regular Windows and Macs as well, but the Chromebooks provide an environment that is totally built in cloud – complete web apps and web storage mean you don’t need any significant hardware capabilities. Now this feature acts as a disadvantage for those Chromebook users who wish to use a mainstream operating system like Windows along with the stock Chrome OS. Keeping this in mind, there is a Citrix app now available on the Chrome web store that lets you run Windows in a virtual environment without the need of actually installing on your hard drive. Called the Citrix Receiver Tech Preview, this Chrome OS app for businesses will let you check your email, review documents, tune into project dashboards, and approve expenses from your Chrome OS Chromebook. For this to work though, you will need your company to not only support Citrix virtualization, but also to have the right Citrix receiver. 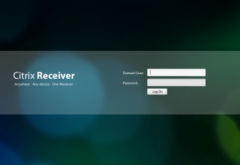 You may need an account with Citrix to be able to log-in and use the app. The Citrix Receiver and is already available on Windows, Mac, iOS, Android, and Blackberry devices. The addition of Chrome OS support means that just about every tablet, smartphone or computer can now access the Citrix virtualized environments. This will move your desktop to your mobile devices which will let you remotely run applications and perform tasks that otherwise you would not be able to do on an Android tablet, iPad or Chromebooks because of particularly demanding hardware requirement. Citrix Receiver does not run on Chrome on Windows or Mac.